While travelling to NY, a 7 seater minivan, positioned at the cramped back seat (for my height yes, it was cramped - I still have a backache!! 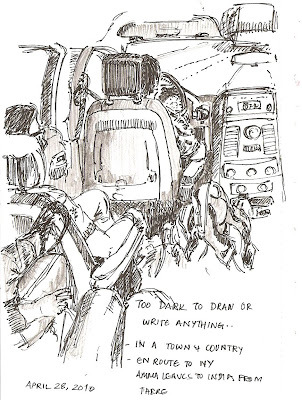 ), Tanush buckled up to his car seat - asleep, suddenly I was totally free and all-available to my sketchbook... Loved hurrying up to draw so much, before the night engulfed me into a dark interior..
What a wonderful sketch! Congratulations for taking advantage of your little bit of quiet time!